By now you are probably expecting another Alaskan adventure story, which means it’s time to shake things up and leave the frozen north for a spell. How about we head for warmer climes? Namely, the Yucatan Peninsula in Mexico. I’d wanted to visit there for years. You see, back in my teens I had this burning desire to be an archeologist and specialize in Mayan civilizations. To travel widely, be in touch with history on a literal scale, it was a heavenly career choice for someone like me. Okay, here’s the romance part of my tale. Marriage bells were ringing. So naturally, me and my adventure loving fiancé decide on a destination wedding and believed Cozumel the perfect place to tie the knot. It turned out lovely too, sunset vows under a gazebo on the beach, a mariachi band playing softly in the background, colorful Spanish decorations flowing in a fresh ocean breeze. It was magical and so very romantic. But it almost never happened. And I’ll tell you why – because of a measly $6.00 airport tax. You see, by necessity we had our honeymoon first. Because Cozumel law states you must be in the country four days before you can legally marry. Not a problem. We were staying at a beautiful resort and they had a helpful coordinator to schedule off-island jaunts. Which is why we chose this destination – it’s proximity to the Yucatan interior and the amazing Mayan ruin complex of Chichén Itzá. Excited beyond reason, we booked the luxury excursion and paid our day long tour price including – you guessed it – a $6 airport tax. That’s per person, mind you. Now, don’t get me wrong, I was completely fine with paying the tax. At least, I was the first time. Well, we hadn’t brought much cash on this flight, mostly due to the warnings of the tour coordinator. She said lunch was provided, free drinks on the plane, and we’d be safer carrying very little cash. Plus, the flight was much less risky than the alternative…a three hour bus ride through local villages with gun-toting escorts and a few chickens in a cage. So really, what do you do? We dipped into our small cache and doled out another $12 bucks to pay the tax. Again. We climbed aboard our 20 seater 1960’s looking prop plane and were lucky enough to snag a seat toward the front where we could see out the window without a wing blocking the view. They billed this flight as luxury. To me, that stretched the term to its breaking point. The free drinks were canned sodas in a cooler at the back of the plane, there was no bathroom (though only a 40 minute flight), and the narrated portion consisted of the co-pilot yelling over the engine noise to point out the relentless forest below. All things are relative I suppose and if you compared the trip to the guns and chickens option, it qualified as luxury. Green was pretty much all you saw out the window. That is, until the stark white pyramid, ball court, ancient observatory, and other ruins popped into view. To say it’s incredible doesn’t do it justice. It totally makes landing that plane on a dirt-packed runway cut out of a tangle of impenetrable trees well worth the risk. It’s all part of the adventure, right? This is the spot where I could spend all day talking about how absolutely incredible Chichén Itzá is. Every step you take on that complex connects you with history in a way that is nearly unexplainable. I mean just look at this picture of the Ball Court below and you will get an idea of the impact this ancient site conveys. Its awe inspiring, deeply mysterious, and a touch of serious spooky. We were lucky enough to climb the steps to the top of El Castillo, the Pyramid of Kukulkan (first picture). Let me tell you the ascent is steep on an alarming scale, but the view is spectacular. And at the risk of sounding like a New Ager, I’m telling you the energy inside that top chamber makes your spine tingle. Or maybe it was a lack of oxygen from the dizzying height, either way it’s a strange sensation. 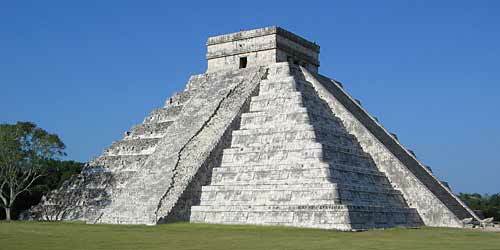 I warn you…Chichén Itzá is an experience that changes you. But again, I’m straying. My story isn’t meant to be a Travel Channel promotion on the wonders of an ancient Mayan city, though it probably could be. No, my story is about a $6 airport tax, so I’m powering on. Well, as I mentioned, our cash supply was small to begin with and after the other taxes we paid, the entrance fee, and a few souvenirs from the fairly nice gift shop there, we had about eight dollars left. We needed twelve. So we argued. “Not here. $6 airport tax due,” he said. We argued this way for a few more minutes until I realized this wasn’t a battle we were going to win. There was nothing left to do but raid the emergency reserve. My fiancé reached into a hidden pocket and pulled out our secret stash. “Can you take a hundred dollar bill?” he asked. That’s when the mild-mannered man I’d known for four years, a go-with-the-flow kind of guy, morphed into I’ve-had-enough-of-this-crap kind of guy. And believe me when I say the battle that ensued gave me visions of a Mexican jail cell with bread and water rations. Others began grumbling, some joined my fiancé’s tax revolt, and just when I thought mutiny was unavoidable, two honeymooners in line behind us came to the rescue. They were staying at our same resort and they did an amazing thing. They paid the $12 tax for us. With the money paid things settled back down, people got back in line, doled out their tax, and boarded the plane. Later that night at dinner we saw our rescuers, paid them back the money, and sent a couple glasses of wine to their table. In the end we had our wedding ceremony as planned and our new friends stood up with us as witnesses. We celebrated the event in the lounge afterward by slamming flaming shots of liquor called Mexican Flags and toasting the fact we were at a posh resort and not languishing inside some rotten jail cell. So the moral of this story is…1) when you leave the country don’t take hundred dollar bills 2) don’t listen to tour coordinators who say you don’t need any cash, and 3) just pay the dang tax. 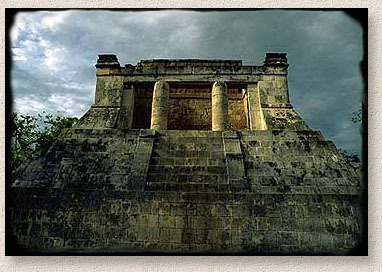 And go to Chichén Itzá. It’s worth every penny of those $6 airport taxes. Just trust me.